Fix your broken chopper, replace a lost part, or upgrade your exiting machine to give it more cutting power. This triple blade chopping insert is the same one that comes with the Kitchen Plus, but it's compatible with many other models that look similar. If your chopper has a blade with a center portion that looks the same, and if it has the same height, it should install and work just fine. Once in place, three incredibly sharp edges will slice through food at differing heights and angles each time you turn the top crank. Cut fruits and veggies twenty times faster than you can by hand with a simple and effortless spin. To use it, simply take out your old one, and replace it with this one. 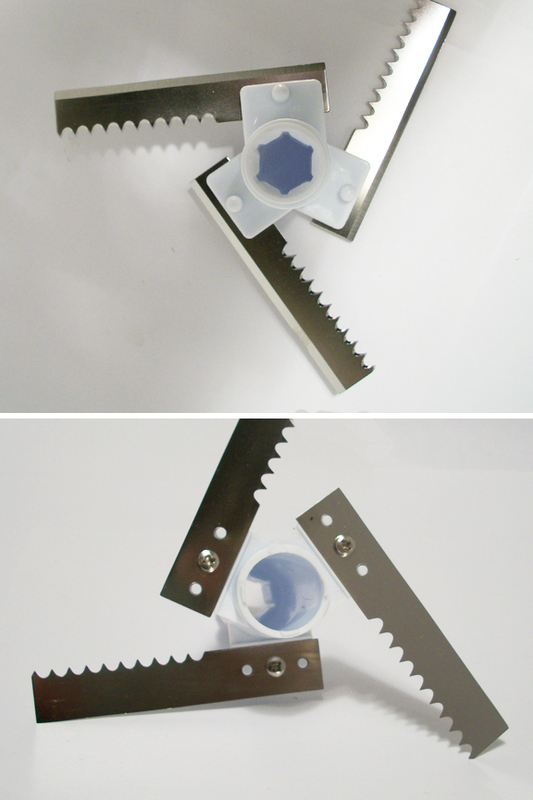 The blade will install at the bottom of the bowl, and the lid will secure on top to keep it in place, and connect it to the gears that drive it. Once you have it installed, just rotate the crank to spin the blades inside the chamber. Top quality construction, and surgical grade steel ensure a long lasting component that guarantees professional looking results. Razor sharp serrations and edges that are sharp on both sides will allow you to glide effortlessly through any type of food. Spin this blade in either direction to chop food to any consistency you prefer. Serrated - A straight design with sharp edges on both sides. One edge features a straight scalpel finish with micro serrations, and the other has a deep, toothy serrated edge. Triple mounted for maximum coverage, and serrated to make it easy to power through any type of food. Prefer a different type of blade? We also carry a samurai style replacement that is slightly different, and compatible with the same choppers. If you like a curved blade you may prefer it over the one featured here. If it look like it will fit your chopper, it probably will. This blade is fully compatible with most of the choppers we carry, as well as some others sold elsewhere. Take a look at the top and bottom connection, and then make note of the overall height. If these two things are the same as the blade you have now, you should be good to go as far as compatibility. It doesn't matter what type of edge your chopper had originally, and it doesn't matter if it had two edges or three. If the center opening is the same, and if the height is identical, it should be totally compatible. Overall Dimensions 5" x 5" x 2.75"
Blade Dimensions .75" x 3.5"
Uses Use as a replacement or upgrade. Chop with incredible speed and precision. Compatibility Included with our Kitchen Plus, but compatible with many other choppers that share the same dimensions. Also use with Our Ultra Chef Express and Salsa Express choppers. Three blades mounted at different levels and different angles. 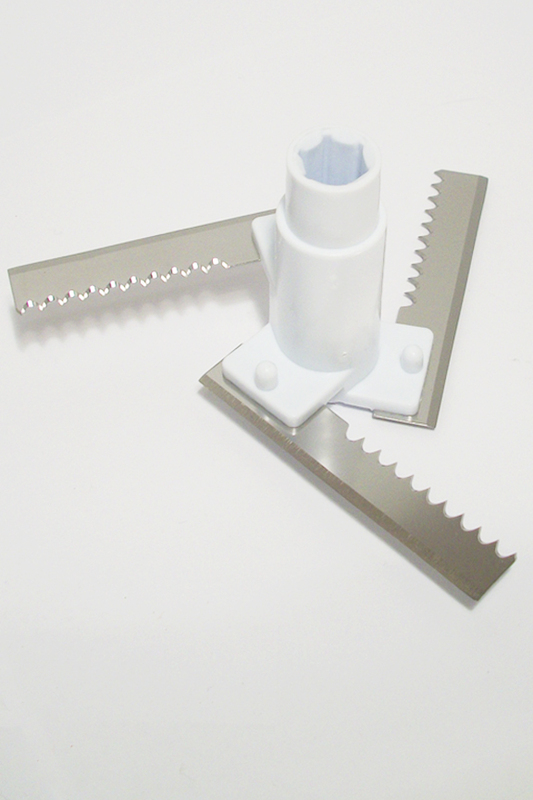 Install in any hand crank chopper to cut fruits and vegetables with amazing speed and accuracy. Order Yours Today! WOW! What a difference a good new blade can make! Chopping has never been sooo easy!